How might we set up the conditions for a new practice to arrive? My chosen method is to put aside words and images for a time and begin to explore an alternative way of designing for others, through cooking. I deliberately describe this as a ritualised practice – which acts as a vehicle for ‘meaningful’ or ‘elevated’ action that helps me not to fall into nihilism. Through this experimentation I intend to generate a means for reflecting upon the crisis, which is ‘palatable’ to others, but also to play with emergent forms of practice through alternative mediums such as food, soil and sociality – the vital mediums which are crucial to any kind of viable future. I've been thinking about living simply a lot in the past year, including what holds me back from a more simple life. I think making these kinds of decisions, requires a certain level of letting go, which in my case might mean letting go of the fear of social isolation. Or perhaps there's another way? I think this is what I'm interested in exploring through the simple living project. To pick up on what I’ve just read, I feel strangely compelled to begin. There’s something so compelling within Tony Fry’s writing that is difficult to find elsewhere. There seems to such lucid thinking – while it isn’t always easy for me to understand (the subject chapter was particularly hard, possible because there’s a gap in my reading there) however for the most part he emphasises the importance of the work of Heidegger and in particular Nietzsche to show how thinkers have attempted to put forward a kind of philosophical pathway for coming to understand who we are and who we might become. I worry that much of this kind of thinking is disappearing – because we’re so bloody busy. This is echoed in Learning to Die in the Anthropocene, particularly in his characterisation of subjects as channels for excited energy, which can also trigger the flow on of fear and agitation. Interestingly Roy Scanton turns to philosophy (he only lists one philosopher) as a means of interruption. Tony Fry goes much further than this, because while theory and contemplation form a part, the key to his understanding of change is remaking (or first understanding the values that brought certain things into being) the world around us, so that is continues to design our ways of being into the future – that are sustainable. I wonder how the understanding of a superhuman fits with the eco-sattva world-view. The qualities would seem to be quite similar, humble, modest, economical speech etc. I feel like these some spiritual practitioners I know are navigating a similar liminal situation, through ritual. But I guess that will need to be investigated. I’m interested to learn how they continue to do this, or what might help them to continue to ‘hold the line’ or remain present to what is happening. Could we play or explore this through forms or practices that might trigger or support and strengthen their resolve? Gee it’s so interesting how technology can completely wipe a contemplative state. I just jumped on my computer compelled to capture some of what I read, and suddenly I was designing Chronos and Kairos logo and thinking about how to change the website. C&K is not a futural project yet. It feels ill-considered and so jumping onto it in this way was a kind of distraction for my mind. Something easy to play with. And that’s ok, but the trouble is I forget. I forget constantly what the imperative is. It’s really hard to remain present to the imperative – to search for the tool to pick up, or the knowledge that’s needed for a more fully realised practice to arrive. And this takes discipline! A lot of discipline or seeing or valuing certain forms of knowledge or making over others. Of making a more conscious decision to expend energy on processes that help me to transition or articulate what I’m trying to do. Moving towards an unknown destination, once the unknown creeps in, it seems to prompt in me the desire to know everything. I feel overwhelmed by the sense of not knowing and feel the intense desire to bridge that gap (which will never be bridged) as though knowing more will satiate some sense of lack. But this is the space in which I must dwell and dwell slowly and contemplatively for anything of substance to really emerge. I've been curious for some time about how a designed approach to food and mealtimes might generate a sense of belonging and raise important conversational topics surrounding social or ecological challenges that we face. We've been witnessing a rise in not-for-profits beginning to engage with food and mealtimes as their primary tool for communication. For example, Climate for Change have been hosting dinners where groups of people learn and refresh their knowledge about climate change. On the other hand, The Welcome Dinner Project use mealtimes to support recently arrived Australians by arranging dinners with established Australians. Sharing food and stories provides a means to overcome stereotypes and build friendships. Conflict Kitchen have a similar objective, albeit their political motives are more overt. They only serve food from countries that the US is in conflict with. These examples, combine sensory experience with educational objectives. They appear to provide an environment where ideas are more readily digestible (excuse the pun). 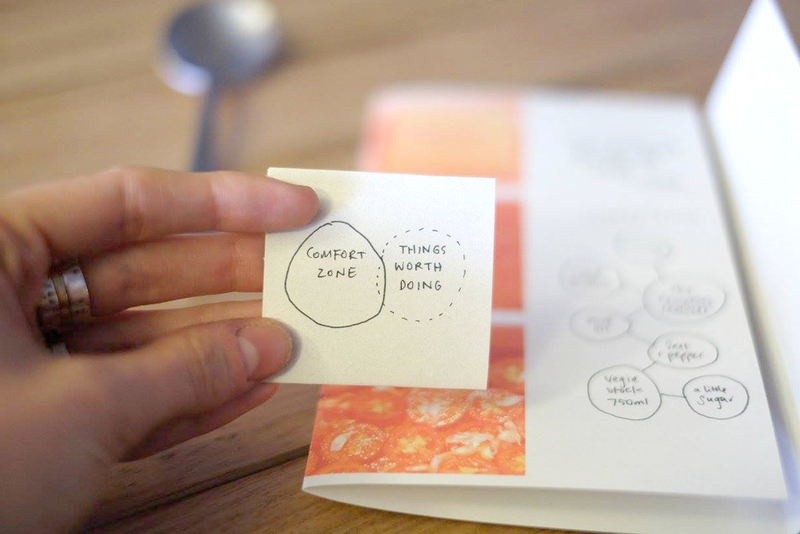 Inspired by many designers that are already working with food (in particular Marije Vogelzang and Cooking Sections) I began experimenting with the idea that a designed approach to mealtimes might facilitate better conversation and create a deeper sense of belonging. Rather than designate somebody as a facilitator or expert to convey information, I am interested in how food itself can tell a story. In other words, can food talk to us? What is needed to animate it? The project that was developed as a result of this inquiry is titled The Monthly Feast. The Monthly Feast is a lunch held by The Weekly Service on the first Saturday of every month. (See here for more on The Weekly Service). The Monthly Feast provides avenues to explore the interplay of ritual and food as a means to build community and negotiate transitional times. I've begun documenting the process of making a feast, which I will detail in posts to follow, however in short I began with an idea for a recipe, which was more conceptual rather than practical. A recipe can also be a ritual. A recipe is a set of instructions, a way to prepare a meal. Additionally a recipe can also entail how the meal is or could be eaten. As a point of departure this project aims to develop ‘recipes for uncertain times’ and forms of ‘edible communication’ that prompt conversation and connection amongst diverse groups of people. 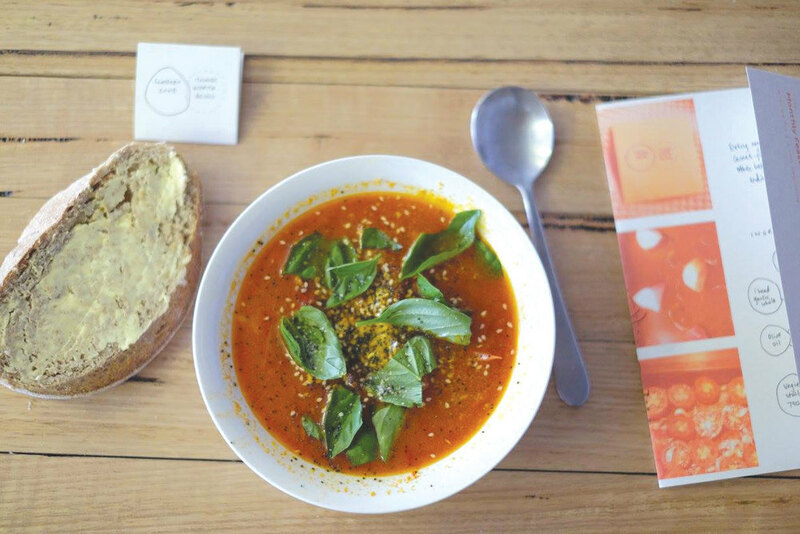 The first soup served at The Monthly Feast. The recipe was titled 'A recipe for a new beginning'. The soup was complimented with ingredients that corresponded to each of the seven chakras. Participants were invited to add symbolically to their dish in order to commemorate a new beginning. The meal followed The Weekly Service, where ex-engineer and speaker Tash discussed her relationship with the chakra system. Seeds from the tomatoes were saved, packaged and gifted to the participants at the first feast. This blog is a documentation of thoughts, ideas, questions and ponderings documented whilst undertaking a PhD in Media & Communication at RMIT University 2015–current.